Run a print head nozzle check to see if any of the nozzles are clogged. Then clean the print head, if necessary. If a blank page exists in a document you are printing and you want to skip printing it, select Skip Blank Page setting in your printer software as instructed below. Windows 8: Navigate to the Start screen, right-click the screen, and select All Apps. Select Control Panel > Hardware and Sound > Devices and Printers. 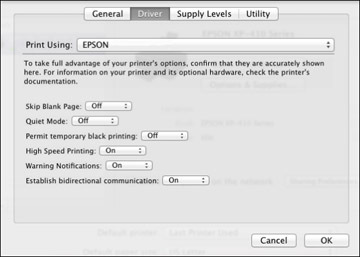 Right-click your printer and select Printing Preferences. Click the Maintenance tab, then select the Extended SettingsSpeed & Progress button. In the Settings area, click on the Skip Blank Page. Select Print & Fax or Print & Scan, select your product, and select Options & Supplies.